We tested the Rio 750 Cruiser, the brand new pleasure sport motor yacht. She fully meets the needs of whoever wishes to cruise in a relaxed and comfortable way (we sailed at more than 35 knots), of whoever wants livability and ample deck and interior living spaces, of whoever looks for unique style and design. The Rio 750 Cruiser meets all the above-mentioned conditions with precision and fantasy: she is very stable and maneuverable, her performance translates into safety and reliability. The outside line is unique and the cockpit is an excellent example of ergonomics and livability. Below deck, four passengers may comfortably sleep in two different cabins. The dinette may be easily converted into a cabin with a double bed. The central cabin has low headroom yet it is very comfortable. The galley is fully fitted and comfortable. The bathroom is ample and it includes high quality fittings. On deck, the Rio 750 Cruiser offers a successful mixture of innovative solutions and fittings such as: recessed shower, access to the aft platform from the cockpit, recessed swimming ladder, rational and elegant fender holder in the aft transom, cockpit dinette easily converted in a comfortable sunning area. 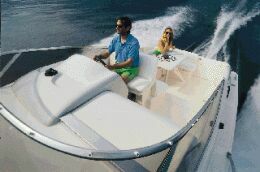 This boat offers not only an excellent quality/price ratio but most especially the fun of cruising. Draft from lower tip of propellers: 1'5"
Total engines and reduction gears weight: 2x629 lbs. Standard fittings: 2x100 A batteries, inflatable raft stowage, deck shower, fender holder with 4 fenders, anchor windlass. Lockers: double anchor locker in bow area, cockpit settee lockers, several small lockers on the sides. Settees and berths below deck are provided with lockers. Helm station: power wheel steering by cable connection, full engine indicators and instruments, horn. 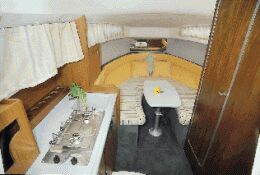 Interiors: convertible dinette, full galley with cabinet and two-burner range, sink, refrigerator, lockers and worktop. The double cabin is amidships and has a full separated bathroom to starboard. Deck fittings: mooring bitts, bow pulpit, bow hatch and bow sunning area, cockpit dinette convertible in sunning area, molded aft platform with cockpit access door, covered swimming ladder and fender holder with four fenders, recessed deck shower.